SOLD King Charles VI Blanc Guenar Pendant; Please Explore Our Medieval Pendants For Similar Items. 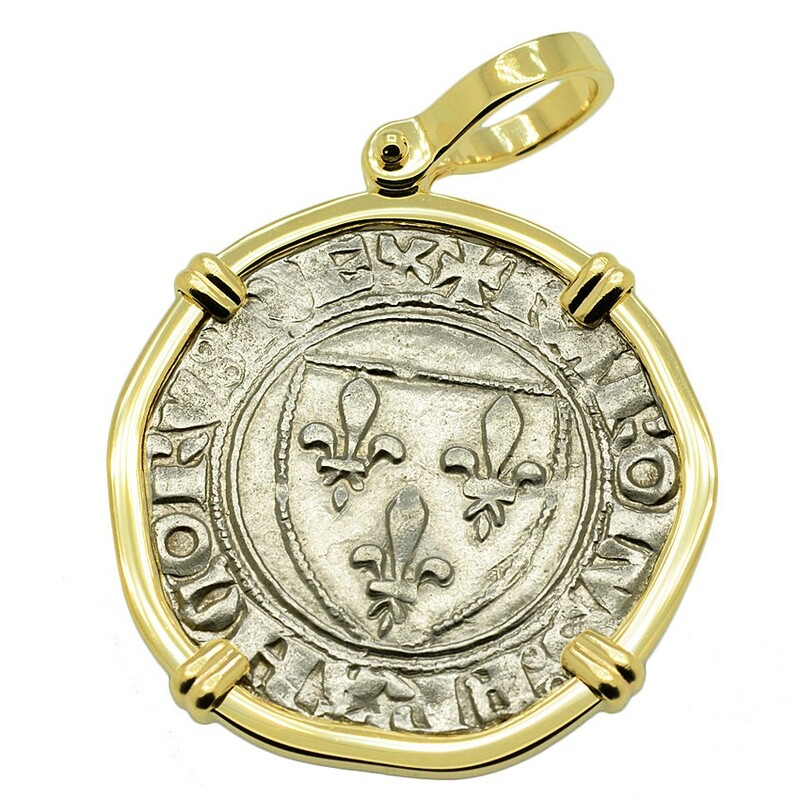 This coin was minted during the reign of Charles VI, who was crowned the King of France at age eleven, in the midst of the Hundred Years' War with England. He ruled from 1380 to 1422 as a member of the House of Valois. 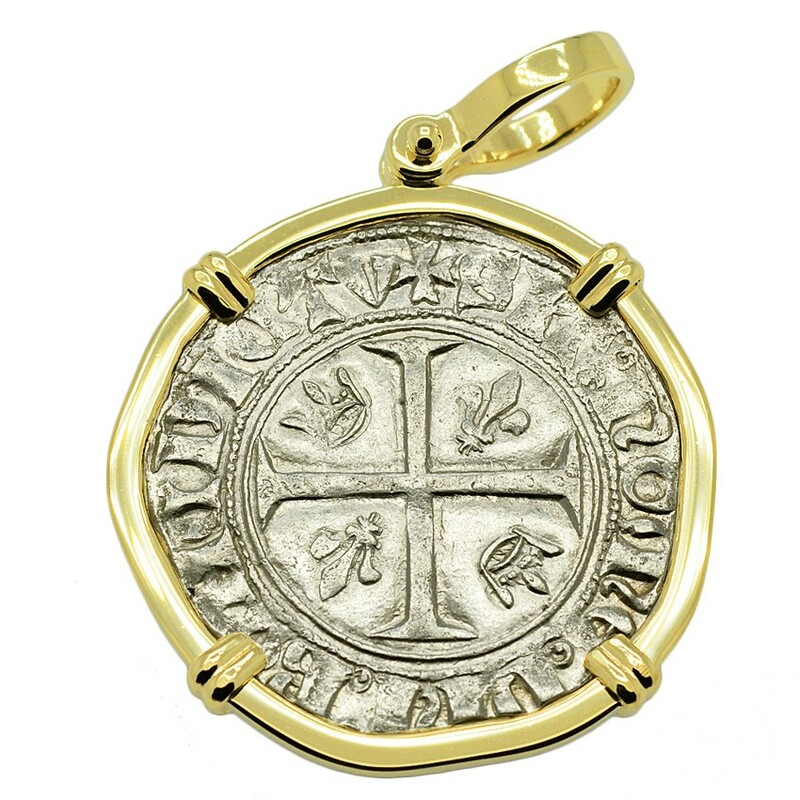 The obverse side features a Cross Pattée with crowns and lis in the quarters. 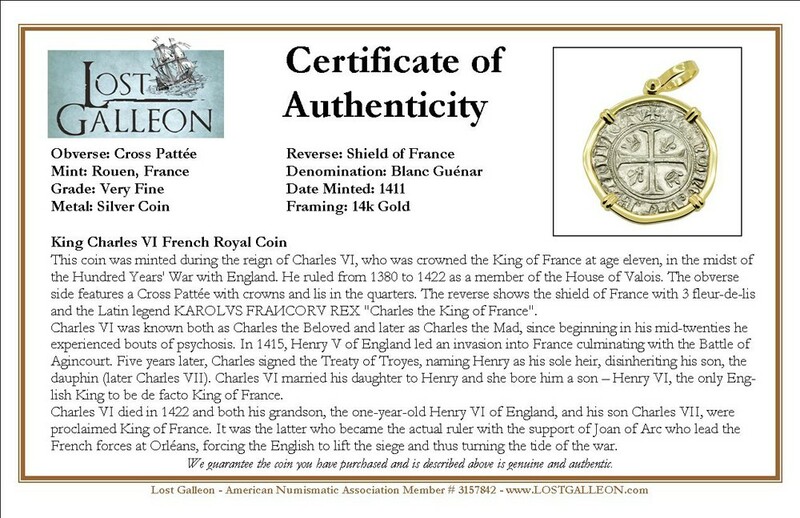 The reverse shows the shield of France with 3 fleur-de-lis and the Latin legend KAROLVS FRAИCORV REX "Charles the King of France". Charles VI was known both as Charles the Beloved and later as Charles the Mad, since beginning in his mid-twenties he experienced bouts of psychosis. In 1415, Henry V of England led an invasion into France culminating with the Battle of Agincourt. Five years later, Charles signed the Treaty of Troyes, naming Henry as his sole heir, disinheriting his son, the dauphin (later Charles VII). Charles VI married his daughter to Henry and she bore him a son – Henry VI, the only English King to be de facto King of France. Charles VI died in 1422 and both his grandson, the one-year-old Henry VI of England, and his son Charles VII, were proclaimed King of France. It was the latter who became the actual ruler with the support of Joan of Arc who lead the French forces at Orléans, forcing the English to lift the siege and thus turning the tide of the war.